I m ake and sell an awful lot of hop inspired jewelry and beer related accessories. Hops are what make beer taste like beer. My DH is a home brewer and we are entrenched in the craft beer scene in Vermont and Asheville, NC. What started as a lark to wear at beer festivals has become a serious piece of my business. So much so that I couldn’t keep up with the demand just using aspic cutters to make the beads. My DH said that there had to be another way. And he was right…..as always. I started with the Cricut Cake Cutter. It was meant to cut fondant and that’s about the same consistency of raw polymer clay. And it worked for awhile. I switched to a MAC and they decided not to support that OS. I was able to cobble along with a half broken PC laptop while desperately looking for another option. We searched around and found a professional cutter – the Silver Bullet – that looked like it could handle the raw clay. And it does. It’s BIG and powerful and able to cut, etch, carve, and all kinds of wonderful things on all kinds of media. It was a huge investment.But something that we needed to do. About the same time Alison Lee at Craftcast.com found out I was cutting raw polymer on a digital cutter. She asked if I could do a class using the Silhouette Cameo with polymer. She already had several classes using the Cameo to make projects from paper and metal clay. Her base had the machine and she wanted to give them something else to do with it. I wasn’t sure if I could get it to work with polymer. I googled and didn’t find a lot going on with polymer. There were just a few instances and in all cases the clay had to be very, very, very thin. I had a friend come over who was using the Cameo with metal clay. We tried everything. We could get it to cut, but it left ‘smoosh’ marks all over the clay. The only way it would work was if the clay was really, really thin. I didn’t think that would be every useful. Then the DH poked his nose into the studio to see how it was going. Hair was being pulled out at this point and there was a lot of swearing. We recapped the problems and he looked it over. Then he very casually said -“why don’t you take the cap off the blade?” Yet again…. he was right. That was the secret. It was the cap that was causing the ‘smooshing’. With that gone we were now able to cut thicker pieces of clay that were more usable. But the Cameo still had a limit to the thickness it could cut. Mostly because of the layout of the machine that was meant to cut paper, card stock, and vinyl. I was able to create a version of my Fantasy Flower Garden necklaces for the class. (The image at the top of the page is a bridal version of that collection). I even used the Silhouette Studio Software to design the flower shapes, colors, and layout of the piece. I continued to experiment with the Cameo to create other projects. I made some ornaments and some what-not bowls. About a year later Silhouette announced a new machine – the Curio. It was built to handle a variety of media in different thicknesses. It has adjustable plat forms and a dual tool holder. By now I was on Silhouette’s radar and was able to score a machine early on for testing with clay. It worked great. I could cut much thicker clay and could even use special tools to carve the raw clay. My next class on Craftcast took advantage of those properties. I taught my recipes for faux gemstones and ivory. Then we created a box using the faux ivory and the Curio to cut out spaces to inlay the faux gemstones and carve designs on the lid and sides of the box. I host a PC SILie Lovers group on Facebook. The ‘files’ section has lots of documents that cover the settings I use to cut different thicknesses of clay. There is a lot of useful information there. But the best way to learn the tips and tricks is by taking the Craftcast classes. The hardest thing I have to do as an artist is coming up with new designs and color ways. I use my Pinterest page to tag all kinds of beautiful things that I see during my hours of surfing the web. A week or so ago someone posted a picture on Facebook of the painted rocks that artist Elspeth McLean creates. She is an Australian artist who is currently living in Canada. The vivid colors and dot designs really spoke to me. I tagged the post knowing that someday that image would be helpful. But it stayed in my mind for days. I went to her website and just sat back and took in the colors and designs. I knew that I just had to do something with what I was seeing. 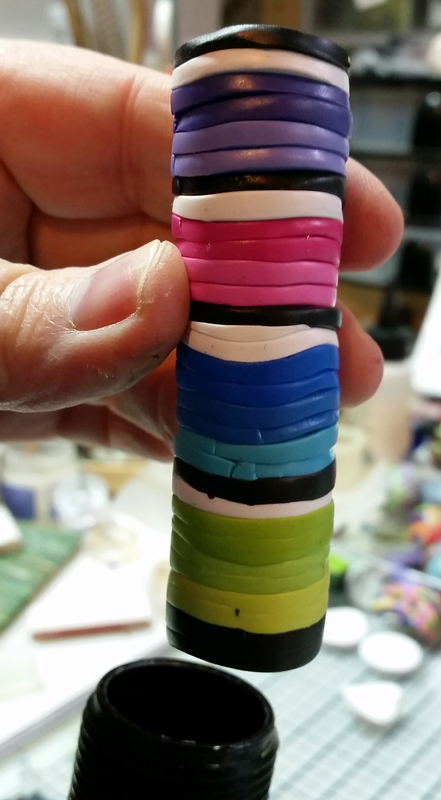 …I mixed up all the colors and used my PCE extruder to spit out the snakes of color to be wrapped by black or other colors. (More on that part in a later post.) I had a lot of the chosen colors left over and decided to play with some extruded canes. Some call them Klimt or Retro canes. Almost every clayer does these at some point in their journey with polymer. They are so easy to do and can create canes that look very complex. The key is to make sure there is good contrast in the colors that you select. I wanted to test how arranging the colors in different combinations would effect the outcome. 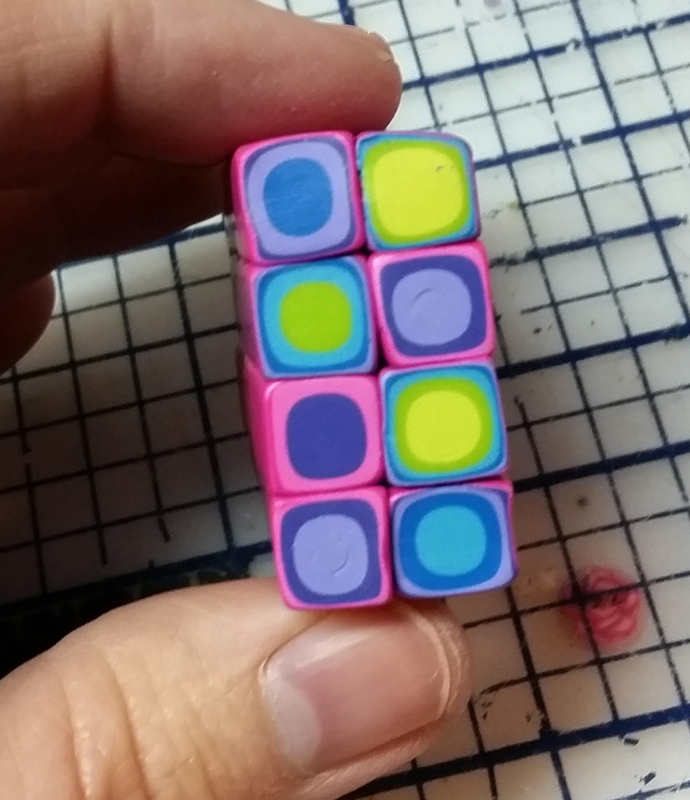 For the first test I arranged the colors in a rainbow with the pink in the middle. Each color family is separated with black and white layers for heavy contrast. And that’s what I got. Good separation of colors with a nice mix of black and white . 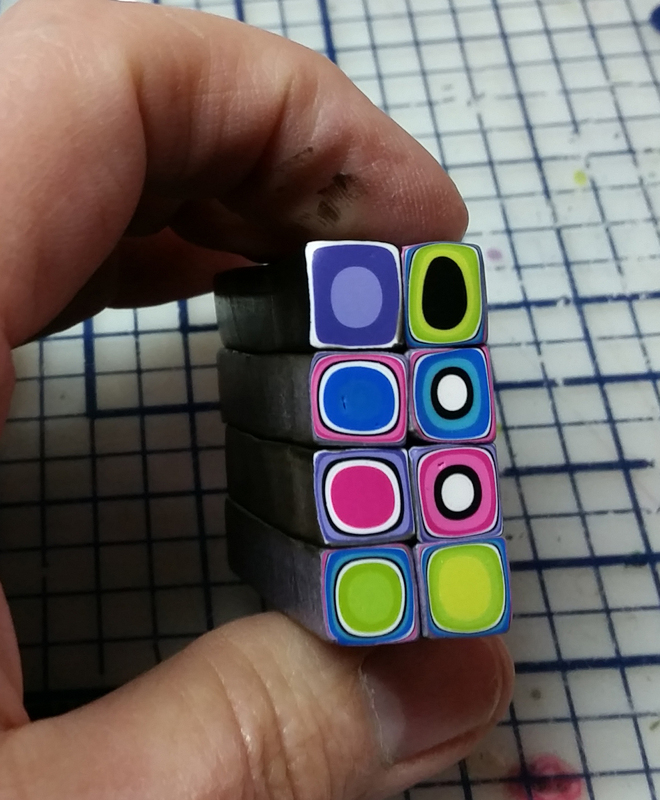 For test number two I doubled up the colors and separated them with black and white again. I thought this line up would give me more tone on tone circles…but it didn’t. Still, I like the result but has a bit more green than I had hoped for. For test numero tres I decided to get rid of the black and white to see if I could get the tone on tone look of the painted rock. And I did get some of that, but not as much as I hoped. However, that’s OK with me. I like how it looks anyway. Next challenge is to decide what to make with them…..
Like so many of you, I LOVE the look of sanded polymer clay pieces. But, also like pretty much everybody – I HATE sanding polymer. It’s messy, it hurts – especially when you sand your fingertips…yes, I have – and it’s boring. AND….if like me….you have issues with chronic pain it is very painful to do the amount of sanding needed for production work. Over the years I have tried several techniques to get the look I want without putting myself into a heightened state of pain. 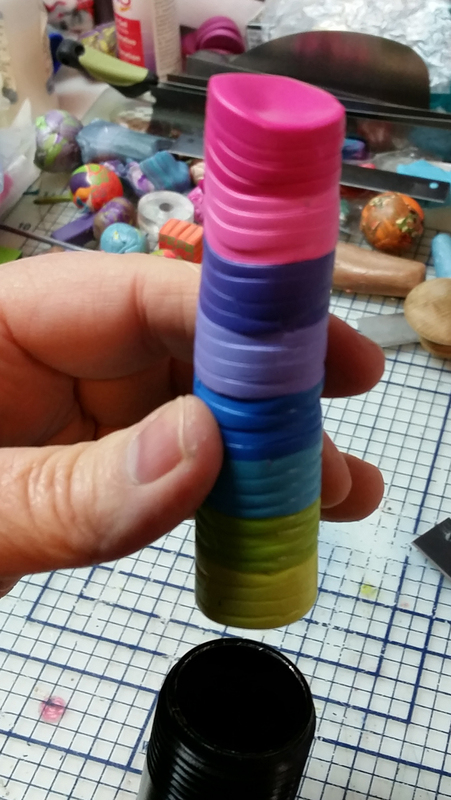 Many years ago I stumbled across Desiree McCory’s site that described how to use a rotary tumbler and sandpaper to sand beads. I used her techniques for several years but found the process very labor intensive. There HAD to be a better way. I think I have finally found that better way. I use a rotary tumbler with plastic media cones from Rio Grande followed by rotary buffing using jean scraps. The media that I been using is the “Standard Plastic Pyramid Media” in Blue, Medium and Green, Fine Cut along with the “Standard Plastic Cone Media, Extra Fine Cut”. I find that this process makes sanding beads a breeze. If I want a bit more gloss to the bead I ‘paint’ on Armor-All Car Finish. I really like the finish I get and it is easy-peasy and pain-free. I have cheapo tumblers from Harbor Freight, but I’m sure that this process will also work with Lortone tumblers. The black rubber drums can stain/yellow polymer so they must be lined. Tall yogurt/s our cream/ricotta containers work well. Liners may need to be cut down the sides to fit the tumbler container. 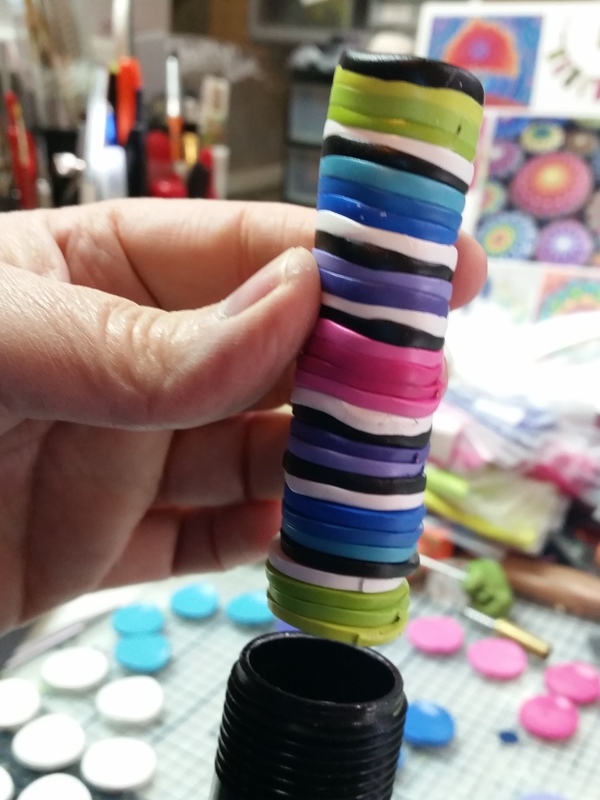 Cut a circle out of the liner’s lid to fit on top. You don’t want any of the black rubber touching the clay. Load the tumbler starting with a handful of plastic media, then beads, then more media, more beads until it the contents are about an inch below the top of the container. Fill with water leaving about half an inch free to allow for media and beads to move around the container. You can start with either the blue or the green media depending on the smoothness of pieces. I usually let the tumbler run for 12 – 24 hours on each media grit. I have not found that a longer time does any damage to the pieces. After the tumbler has been run pour the contents into a colander and rinse. Make sure to clean the liner and barrel between grits. To buff by tumbler you need to cut up a pair of old jeans or purchase denim – some suggest using white denim – into 1 – 2 inch square pieces. Layer the jeans and the beads as before but you will be tumbling these dry. I allow this stage to run for between 12 – 18 hours. Again, it doesn’t hurt to run it longer and you can probably run it for as little as 8 hours. I have seen some post recently that people are using polished rocks. I haven’t tried this yet and would be interested if anyone can share some before and after shots. I’ll post some other alternatives to hand sanding in my next post.